All other seasons in Florida are quite pleasant but summer is H-O-T. With a rapidly growing pregnant belly, it is even sweatier and hotter than normal. So truth be told, I have been living in shorts, t-shirts and white Birkenstocks (hard to bend down to tie those gladiator straps with a belly on the way). But for the rest of you passing the summer in a “this-is-amazing-weather” attitude, these summer trends would be so much fun to try. 1. It’s all about the ties. Gladiators are just so much fun and after almost a decade, the trend has come roaring back and is edgier than before, with leather straps up to the knees. For the bashful among us, espadrilles are the other shoes for summer (besides, all those leather ties up the legs could get sweaty), updated with hardware and wrap-around ties. Even flats are getting the ties update. Now, if only I can bend down to put these shoes on. 2. White lace. I know I’ve been touting white and lace since last year but both of these elements combined are just perfect for this summer. Probably because of gladiators sandals, white lace is rendered a little tougher and less frothy. Seen on Chloé’s ready to wear summer 2015 collection, other designers such as rising star Self Portrait have followed suit. Even better is that you can also find less expensive versions via fast fashion brands. Update lace for later seasons in moodier and darker colors. 3. Off the shoulder. It’s hot and it’s time to bare those shoulders while the weather allows for it. Pair it with shorts for now and with skinny jeans for when it gets a little cooler. Dress down with espadrilles or dress it up with heels, it’s all up to you. 4. Culottes. I know that this is not for everyone but think about it – you get the flowy silhouette of a skirt without fear of said skirt blowing up when it’s windy. Plus, the new culottes come in so many options in volume and in length. If I wasn’t so pregnant, I would seriously consider this – stylish and practical. 5. Pom-poms and tassels. Bohemian style abounds and for accessories, what could be more fun than pom-poms and tassels? Since I’ve been researching/buying a lot of stuff for the house, I even found pom-poms on bedding. Then reality set in and thought of my toddler picking at the pom-poms. And seriously, who could resist these things? It’s almost redundant to put classic and staple together. Being a staple – an important thing, feature, or element of something, in this case your wardrobe – means, by default that it would be a classic, no? Not exactly. Jeans are a wardrobe staple but having them in mom-jeans and acid wash style may not exactly count as a classic. Over the past year, I have been looking to really simplify my dressing routine and tried to adhere to what I preach about sustainable and clutter-less fashion. I think I have been largely successful, though the amount of stuff I have returned by mail is not necessarily a small carbon footprint (I buy almost everything online). Here’s a list of items that should be mainstays in any wardrobe and in what style they should come in. Jacket/Coat/Trench in camel. I have been touting this for awhile but you have to admit, camel-colored jackets and outerwear have been around for a long time. Chances are, they’ll stick around. Striped top. There seems to have been an explosion of stripes from shirts all the way to shoes. But a striped t-shirt that you can throw in the wash and hopefully come out not too wrinkled is something you can rely on for years to come. Black skinny jeans. Leggings/tights would be more comfortable but jeans have a little more structure to them. Keep them in black, whether ripped or unripped, to bring an outfit from day to night. Understated bag. I prefer the crossbody style for this. I never get the top handle bag that gets slung on the crook of one’s arm even though it looks fantastic. It just looks so unnatural and uncomfortable to me. I used to prefer the good old shoulder bag but with a baby in my arms, a crossbody is a better option. Pointed toe shoes. As a pair of flats, the pointed toe shoes can be a great runaround pair of shoes without looking sloppy. If you can add some details like studs, leopard print or straps, not only can they be runaround shoes but can also work for date night. A little more than 10 years ago, I walked in to a Stuart Weitzman store in Aventura Mall in Miami, FL and then walked out in irritation. I was in the market for my occasional splurge-worthy, fancy pair of shoes and it seemed like a fancy store. It had fancy prices but the shoe designs themselves looked so boring and unimaginative – certainly not for my twenty-something self back then. Fast forward to today and with the founder/CEO/Creative Director Stuart Weitzman’s “showboating tricks” such as the ““Million-dollar Shoe”, the Stuart Weitzman brand is cool again with a reported $300M one-year revenues ended in Sept. 30. The footwear hits include the 5050 and Highland boots, the Nudist and Gladiator sandals. Last month, it was reported that Stuart Weitzman was up for grabs by private equity firm Sycamore Partners. On Monday this week, Coach filed a Form 8-K announcing the purchase of Stuart Weitzman for $530M in cash and potential earnouts of $14.66M annually in cash over the next 3 years if revenue targets are met. The $574M-deal is set to be finalized in May 2015. Since its founding in 1941, Coach has focused exclusively on its own label and has found success doing so – from $953M in sales a decade ago to almost $5B last year. But 2014 has been an especially tough year for Coach. Since its high in 2012 trading at $77, the company’s market value has plunged to $10B today. Put simply, Coach bet too much on promotional events and its outlet stores to ramp us sales. In the process, the brand lost its allure as “aspirational” and yielded market share to Michael Kors and Kate Spade. The drop in revenue figures in 2014 was in part due to a transformation strategy that resulted in the closure of underperforming stores and drop in promotional events. In 2013, the company hired Mulberry and Loewe alum, Stuart Vevers as the new creative director. The company also staged its first New York fashion week show in February 2014. Vever’s collection hit stores in September 2014 and was received favorably by the fashion press. In October, Coach posted its 6th straight quarter North American sales declines. The impact of Vevers may yet to be reported in the company’s upcoming earnings report on January 28 2015. Why did Coach buy Stuart Weitzman? Coach is doing a two-pronged approach to its turnaround: to be a lifestyle brand and to be an “aspirational” brand once again. In order to be a lifestyle brand, the company must rely on products beyond its handbag business which, last year accounted for 77% of its $4.8B revenues. Footwear is a growing market and Coach entered the shoe business in 2013. So far, it only accounts for less than a tenth of Coach’s overall revenue. With the Stuart Weitzman buy, Coach can capture a piece of the mid-luxury shoes pie. After all, most often than not, women buy more shoes than handbags especially in mid- to high- luxury segments. Furthermore, the company can leverage Stuart Weitzman’s know-how in managing the footwear supply chain, something that is markedly different from handbags. Unlike handbags, footwear comes in different sizes for every style which can be an inventory challenge. Stuart Weitzman is vertically integrated, owning the factories that produce its footwear. Part of Coach’s moves in the past year has been to mark up their handbag prices from the usual range of $200-$400 in order to up the brand’s exclusivity. In its October earnings report, the company reported that North American sales for handbags costing more than $400 accounted for 30% of handbag sales. It seems that as a handbag maker, the brand still has some cachet. The same could not be said of its relatively new shoe line. Marking up $150 shoes to $400 requires a lot more traction. Stuart Weitzman’s mid-luxury footwear can help solve this problem. What are the concerns with the deal? One of the biggest concerns about the deal is that Coach is in the midst of a large scale turnaround plan. Other than what I mentioned above, the company is also redesigning its stores in line with offering more than handbags. With the purchase, Coach might lose focus and redirect resources that are supposed to rebuild the brand into integrating Stuart Weitzman into the company. Another way to look at this is: even with Stuart Weitzman’s $300M revenues and projected 10% growth, it is still not a big enough impact on Coach’s bottom line. Coach has to make its handbags cool again and grow Stuart Weitzman’s operations just to move the earnings needle a little more. That is quite a lot to tackle. I personally applaud Coach for buying Stuart Weitzman. They need to be able to compete in the growing mid-luxury footwear market and they have done a seemingly halfhearted and late attempt so far. Stuart Weitzman is already there with a ready list of hits and a following under its belt. I also like the fact that Stuart Weitzman owns the factories that produce its footwear – those assets and the know-how that comes with managing those operations are definitely worth $574M. It’s the holidays and Black Friday is just around the corner – need I say more? P.S. A note on the links: I tend to stick to certain websites (heavy on Mango, Topshop, Net-a-Porter, Zara) because I prefer the items to be by themselves and not worn by a model. For this particular list though, I found quite a lot of great party dresses on Anthropologie.com and great Aussie labels on Fashionbunkr.com. Compared to my guide to fall trends, I have to admit, I was a little lost with winter trends. For one thing, being in Miami means that winter is the furthest from my mind. Plus, do we still care about fashion when it’s freezing cold outside? I remember when I used to live in Montreal and Boston, I only had one good Burberry coat (a Black Friday find at the outlet mall – the ONLY time I shopped on Black Friday), black boots, thermal sweaters, a leopard print beanie and that was all I could be bothered with. I have to admit though that I wish I had some of the items below just to break up the monotony that winter frequently brings. Side-note: if you want to stay stylish *and* warm, invest in a Burberry coat that can carry you through several years (mine is 5 years old). I always get compliments on it and I was toasty; no other coat came close. 1. Statement sweater. There is a fine line between an ugly sweater and a statement sweater so tread carefully. Because your top half already grabs all the attention, keep the rest minimal and slim to counteract the inevitable volume of any statement-making elements on the sweater. 2. Camel topcoat. Not only is this a very hot item right now, it’s also a classic so there’s no need to overthink it. If I have to get another coat, I would get this color. 3. The embellished boots. This has been around since 2008 – at least for designers Chloé (Suzanna) and Balenciaga (cutout boots). But, it has taken several seasons for mall brands and indie designers to follow suit with their own versions. These days, embellished booties abound and you can finally take part in a more wallet-friendly fashion. Styling this is about contrast – a floaty dress (mini, midi, maxi) and delicate jewelry balance the toughness of the boots. 4. Winter florals. Who doesn’t love florals? This winter, look for darker tones and pair it with a moto leather jacket and oxfords. Or, if you want to keep florals on your feet, keep the rest simple. 5. Feathers. Okay, this one is *not* a classic but who can resist the glamor of feathers, especially for those holiday parties? And style icon, Jenna Lyons, once again shows how this trend is done. It’s been awhile since I’ve posted The List and I know that for a lot of people experiencing the beginning of winter, this particular list might belong way in the future. Because, really, can you imagine wearing white sneakers in the winter sludge? I can’t and I suggest that you don’t even try. After all, the idea of the white sneaker is to be comfortable *and* polished. So scuff marks are not allowed and certainly, neither are dirt marks. For a guide on how to keep them that way, head over to Fashionista here. But for some of us living in perpetual summertime, the white sneaker is a tempting trend to try – it’s classic and it looks so effortless. The inspiration for pairing it with a tulle skirt is pure whimsy on my part. I tried on this tulle skirt yesterday and immediately thought of white sneakers. I also happened to be wearing a white button down and it just seemed to work. Splurge or save on this trend, it’s entirely up to you. By the way, check out my published post on Seeking Alpha here about fast fashion retailer H&M. Every quarter, I publish a guide to the season’s trends. I also publish “lists” as shopping lists related to trends. As much as I want to build my wardrobe to remain season- and trend-relevant , I am more of an editor – meaning, I curate my wardrobe at least twice a year. I also tend to stick to classics and maintain the same clothing size (well, except for pregnancy) because changing sizes means more clothing expenses. Being an editor was not exactly a conscious choice. It was more a result of circumstance – over the past 4 years, I have moved 5 times in 5 cities scattered in 4 countries. Prior to that, I had a closet the size of 2 (maybe 3) big suitcases – I should know since I also had to haul said belongings to several places. Unlike the average woman who owns over $500 worth of unworn clothing, I can honestly say that within the past 5 years, all my clothes have been worn and more than once. I chalk the earlier years to not knowing my style completely and buying some items on impulse. I seldom, if ever, have moments of “I have nothing to wear”; those moments being only when I was hugely pregnant. When you have fewer clothes, you take a lot of the guesswork out of dressing. It’s the paradox of choice – more options don’t necessarily mean it’s better. As I get better at being an editor, packing for travel or for a move becomes less and less agonizing. It’s not just the lesser volume of clothes that I have to carry during a move. Again it’s also the fact that I have fewer choices when it comes to assembling my luggage for travel. Having these in mind, I decided to write a piece on sustainable and clutterless fashion. I hope that you will also find it useful. where a product is created and produced with consideration to the environmental and social impact it may have throughout its total life span, including its “carbon footprint” (emphasis added). The total life span of a plain white t-shirt for example starts from the cotton fields – how those fields are managed, whether it’s environmental (water management, land management) or social (farmers’ rights and wages) – to the store where it is sold to the end consumer. Because every aspect of the supply chain must be rendered sustainable, eco-fashion usually ends up with a relatively high price tag. Scale is difficult to achieve. In fact, it would be antithetical to the notion of eco-fashion, where minimum consumption is encouraged. It must also be high quality if the item is supposed to be for long-term use. For a great case study of sustainable fashion, read more on one of the best and pioneers of eco-fashion, Patagonia. Fast fashion is the opposite of sustainable fashion. Inditex’ Zara and H&M’s value proposition is that they can rapidly respond to trends and produce it in massive scale – regardless of the source – and deliver it for low prices. As scrutiny grows, companies like these are learning to be more transparent about their supply chain but the fact remains that most of the clothes they produce are disposable. Do you really “need” it? As in, do you still think about it the next day or several days after? Does it fill a hole in your wardrobe, i.e. you “need” a coat because your old one is showing its age? If not, then it would have been an impulse buy. Impulse buys are fine if you can easily return it but most people end up keeping such purchases, either because they simply forgot or it would have been inconvenient to return. Can you wear it at least 5 different ways with items that you already own? Or if you want to be more existential, does the item fit your life? Can you wear it at least 30 times? Classics, such as a button down shirt, are great because they can withstand several seasons and trends. If you go for a trendy piece, the question to ask is if it’s something that can be reworked or reframed back into an outfit even when the trend has passed. Finally, the quality should be good enough to withstand washings or normal wear and tear. I find the second and third question to be great ways to weed out a lot of potential purchases. I have a weakness for unique and embellished pieces – what I call the precious (and expensive). But, let’s get real. I am a full time mom who works from home. Chances are, if I get that beautiful suede shoes with gold accents, I will likely wear it three times in a year with one or two outfits. Or, if I get that soft and silky shirt with gold studs, my baby will most likely burp on it or gnaw on the studs – you get the idea. If you’re also interested in the kind of fabrics that are considered sustainable, you can read a comprehensive guide here. But, I do understand that even after warding off temptations, you might still end up with a closet that is cluttered with amassed random pieces. So, how do you deal with it? If you haven’t worn something in a year (and you actually forgot about it), chances are, you will never wear it. Look to your circle of friends for potential clothes-swapping or if you’re tech-savvy and don’t mind the time investment, you can always go to eBay or apps like Vinted and Poshmark to get rid of unwanted clothes. For higher end items, go to your local consignment shop or use the website Vaunte. Otherwise, you can drop off used clothes to the local Salvation Army store. Be mindful though, that clothes have to be usable. Plus, secondhand clothes don’t always go to the needy. Organize your closet. This is probably something we all want/plan then forget to do. If you do get around to doing it, try organizing in terms of outfits instead of categories. 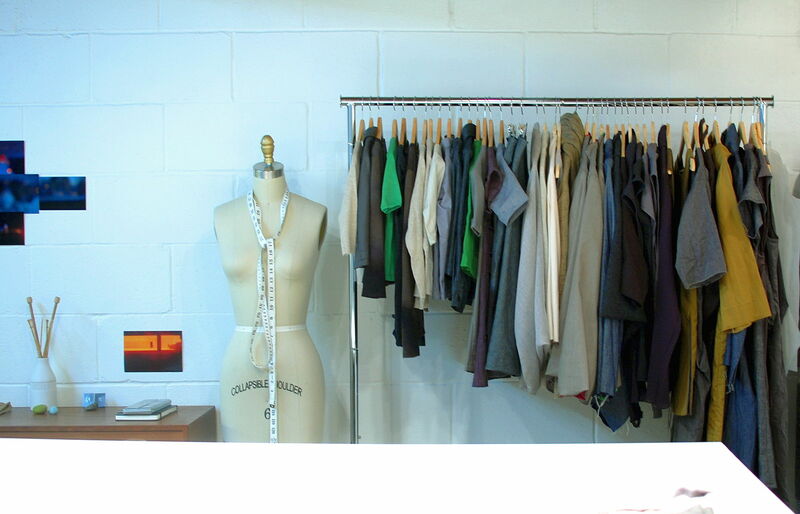 If you have the space, use a garment rack to display outfits. Not only will it take the stress of dressing in the morning, it can also help you get an idea of the things you already own vs. the things you think you still need. You can also try using open shelves/cupboards to avoid stashing clothes in the back of the closet. There are also smartphone apps to organize your closet if you really want to get into it. The thing with fashion is that it can either be something you aspire to be (experimenting) or represent who/what you are. Yes, the latter sounds superficial but unless you’re a hacker whose mind is completely absorbed by problem solving, most of us really do think about how our clothes can represent us. Experimenting is well and good – especially if you’re young or have been through a major life change. In the end, though, your closet should fit you, which means purchasing things that you will actually wear and not things that you think you will eventually wear. Compared to my guides to spring and summer trends, I’m finding it harder to encapsulate a guide to fall trends. Most likely because it’s my favorite time of the year and I find myself excited to try almost everything. Fall conjures cozy evenings with a lingering glow from summer – not just the atmosphere but in terms of how one feels inside out. Fall is the most visible sign of changing seasons with the explosion of color – well, unless you live in Miami like I do, then it’s a season like any other. But, you can see that I can truly go on and on about how much I enjoy the fall season. But I will have to restrain myself and stick to a few key trends that can also be worn together. Pardon me if I also sprinkle some accessories trends into the mix: pearls, the bucket bag, booties and ear cuffs/ear jackets. Cobalt blue and cream. It’s such a rich color combination, yet so classic that anyone can wear this. The possibilities are almost endless (possibilities as applied to combinations of top, bottom, shoes, accessories are not truly endless, are they?). Chunky knit and leopard. We can all thank Phoebe Philo of Céline for making cozy knits so on-trend – her Fall 2014 collection were full of them. You can unearth some of these from your closet or update the look with on-trend colors such as pink, pale blue and grey. And how about them, leopard prints? Dress in head to toe (on second thought, maybe not) or use as an accent, it’s up to you. Stripes and relaxed denim. I mentioned nautical dressing in my guide to summer trends, but stripes still reign supreme. Paired with relaxed denim (stash those skinny jeans for now) and you’re ready for the weekend. These are your new closet staples. Checks and plaid. Did you know that there is an Instagram account dedicated to J. Crew’s gingham shirt? Now you do and right on time too because checks and plaids are in. Dress it up with some gold accents and a structured bag so you won’t feel like you’re going to a camp in the woods.